I have yet to do a "what you see, is what you get" type of livestock availability list on my blog, but some day I may. 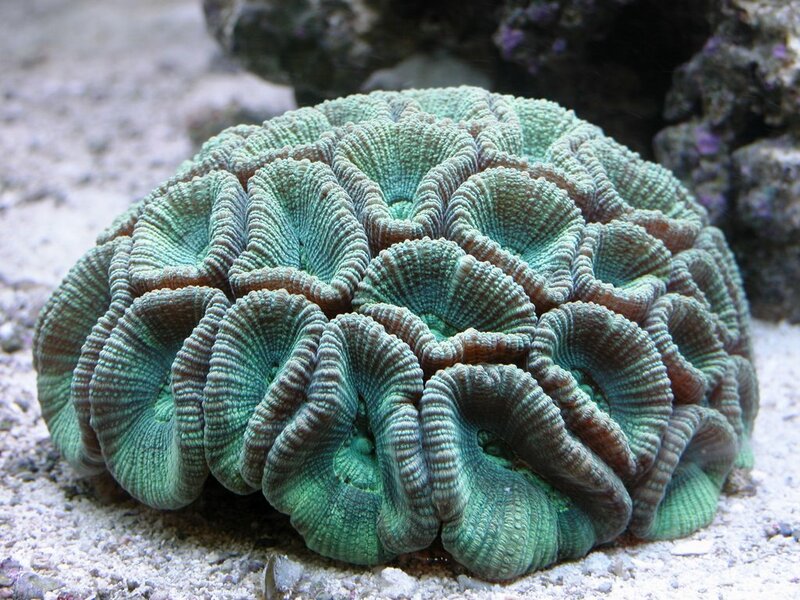 I was speaking to a client last week about an available space in her aquarium and she was thinking about a trachyphylliidae, open brain coral. I happened to have a very healthy moon coral, commonly called a closed brain coral, in stock for the past couple of weeks and with an email and a copy of these of photos, the piece was sold. Moon corals, of the favite family, are some of the most common corals in the world. They are typically massive, domed or rounded shaped. 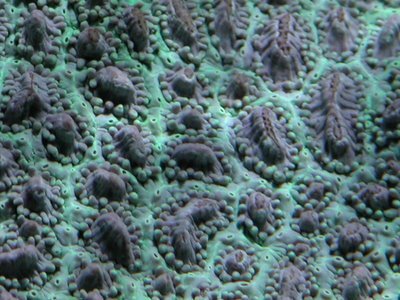 Favites are often hardy corals and very well suited for captive care in a reef aquarium, tolerating a wide variety of lighting and flow conditions. Feeding tentacles emerge at night, the flesh typically remains expanded during the day, as in the photo above. 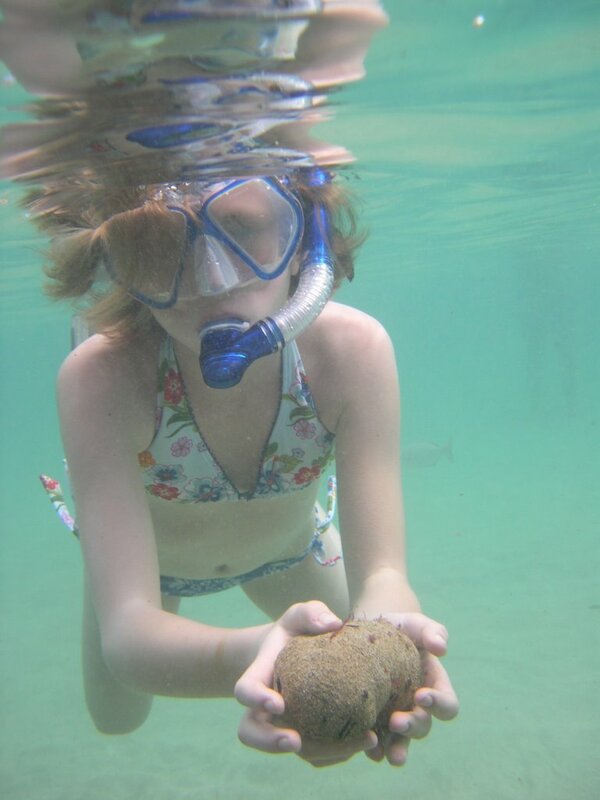 This coral is about 4 inches in diameter and 2 inches in height. 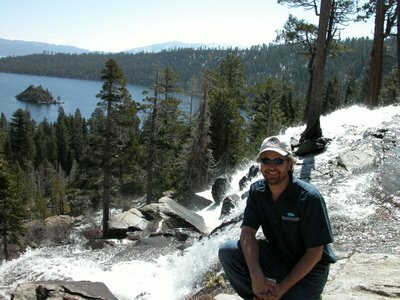 For a man who spends endless hours at his computer conversing with literally thousands of hobbyists it's impressive he's able to find time to write and manage a new quarterly publication, C...the Journal of Aquatic Science, Travel and Adventure. 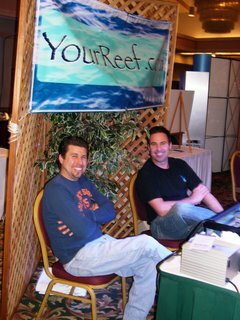 Anthony's expertise can be found at Team Marine Depot's "Marine Systems and Husbandry" forum, Reef Frontiers "Reef Corals with Anthony Calfo" and his home pages at Wet Web Media and Anthony Calfo's Reading Trees. Here's a quote from Anthony on the Marine Depot forum: "It's been a busy year as usual, but a blessing to have good work! I am very proud to announce the release of my latest project: C . . . the Journal of Aquatic Science Travel and Adventure. The image work is stunning and aimed to impress as well as educate... the construction quality of the magazine itself is of the highest - it's the same or better cover stock and body pages than your favorite perfect bound books! This journal is printed on 100# gloss laminated stock with thick 80# pages to hold all the ink from those beautiful pictures!" If you are unfamiliar with the work of Anthony Calfo, the Book of Coral Propagation; Volume 1 (Volume 2 is in production) and Reef Invertebrates: Selection, Care and compatibility are available at his Reading Trees website. Anthony has always been a huge supporter of local reef clubs including the Marine Aquarist Roundtable of Sacramento and the Western Marine Conference. 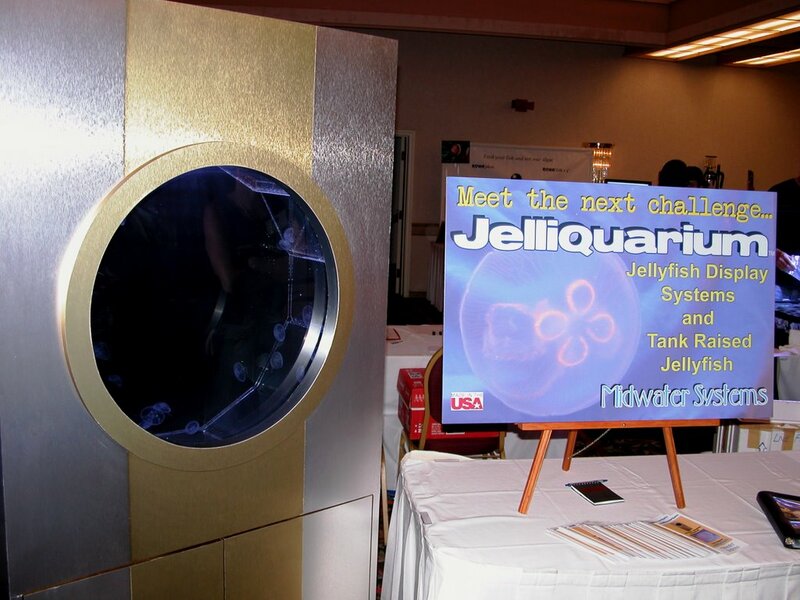 This weekend he will be at the Southern California Marine Aquarium Society's "Reef-a-palooza" speaking on Black-Body Radiation, Lighting Technologies and their Spectrums. For a gentleman from Pennsylvania, he travels the world sharing his knowledge monthly. 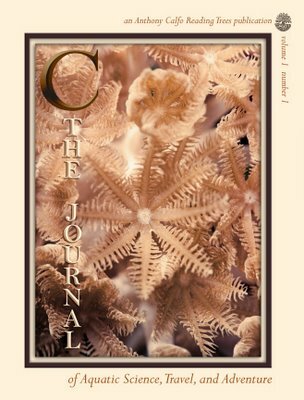 If you are a fellow admirer of the sea, this journal is for you. If you are a client of mine, you may just start seeing this publication in your hands soon. 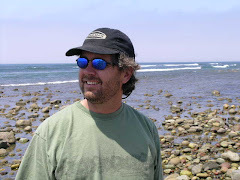 Steve Tyree, Reef Farmers, brought a very successful Southern California event to Northern California last weekend, the Bay Area Coral Farmers Market. 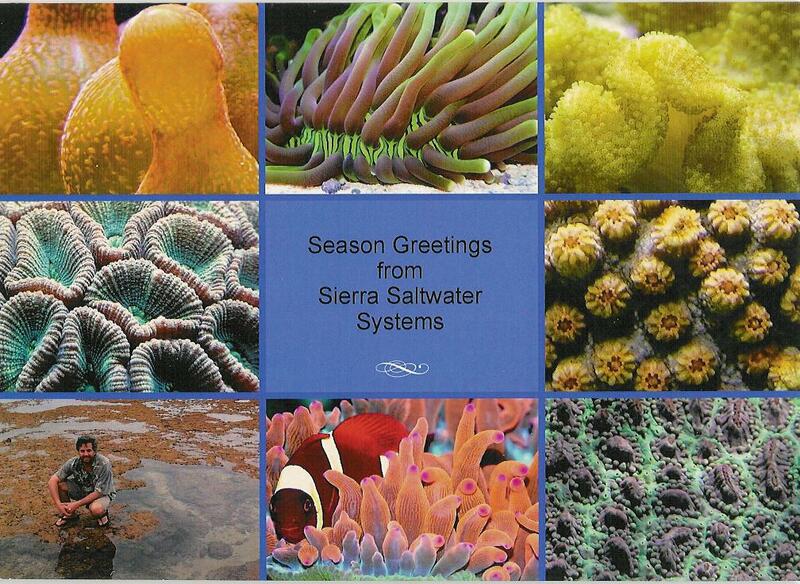 These events feature the retail distribution of farmed and cultured corals. Steve is already eying adding a third event to the rotation in 2007. 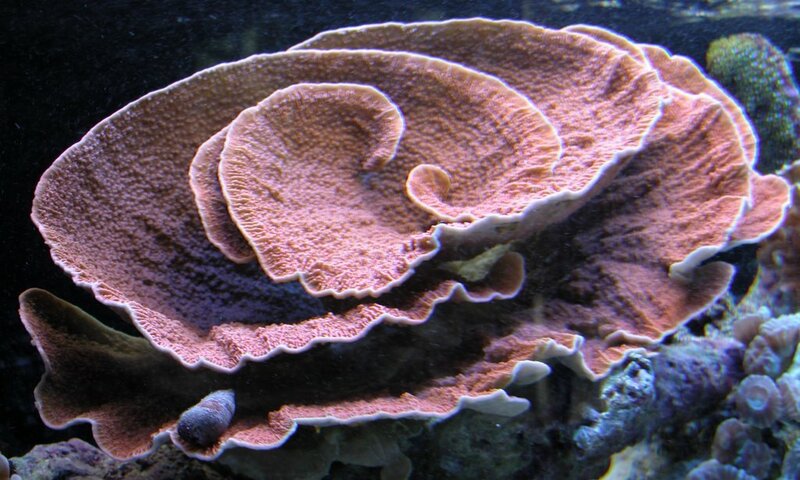 Aquacultured corals are hardier than wild caught specimens because they have already adapted to tank life. Captive reproduction is the only means of sustaining this hobby. On every level from the wholesaler and collector to the local fish store (LFS) owner, to the service industry, to the hobbyist, captive propagated corals must be demanded. 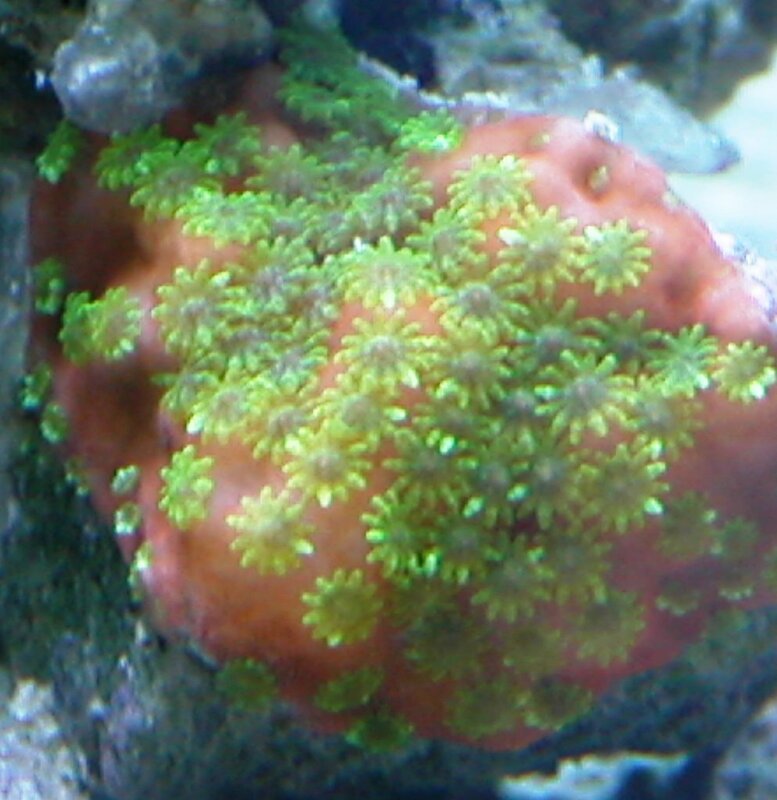 Limited Edition Green Polyped Sunset Coral I purchased this limited edition frag from Steve Tyree and reeffarmers.com mainly due to its striking beauty, but also because of the uncertainty of its specie. 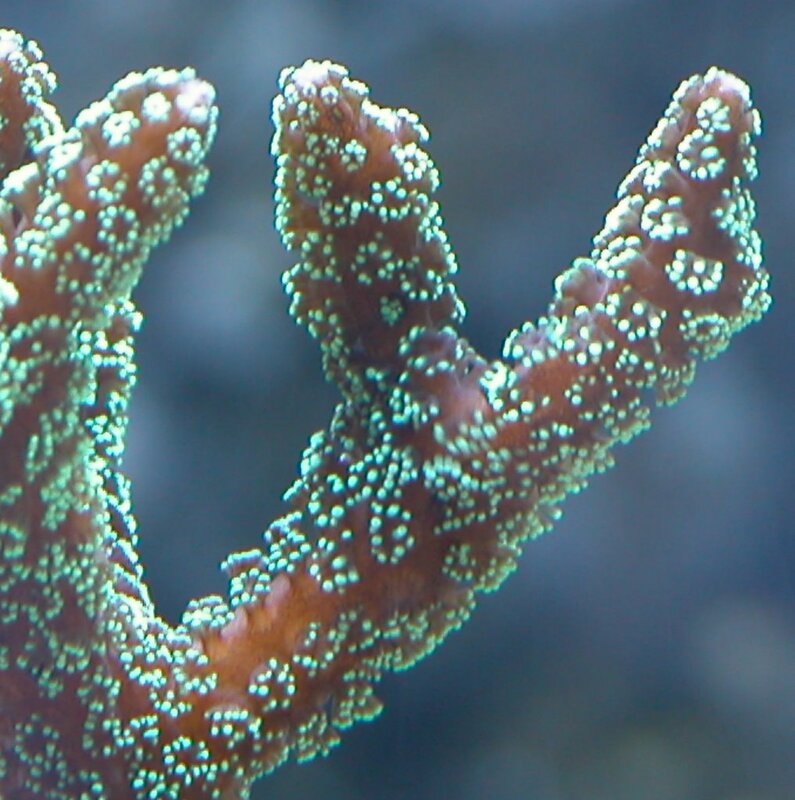 Polyps are twice the size of average Montipora, they extend regularly during the day. 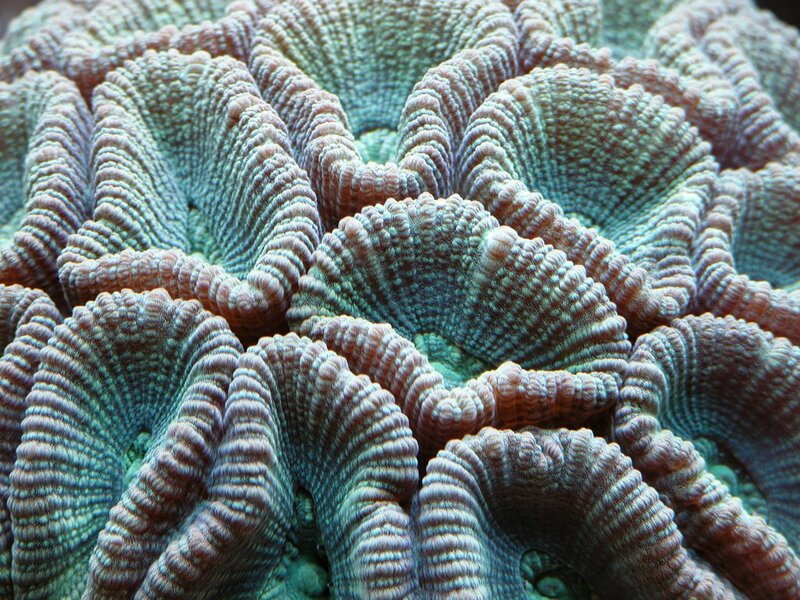 When heavily stressed the corals living tissue will retract inside the skeleton and it can appear almost completely dead. 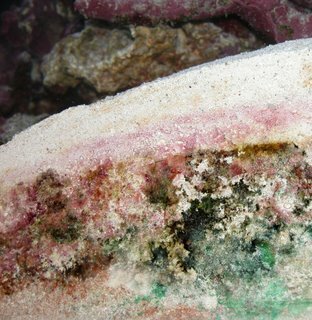 This coral however will recover from heavy stress quickly and can even encrust quickly. 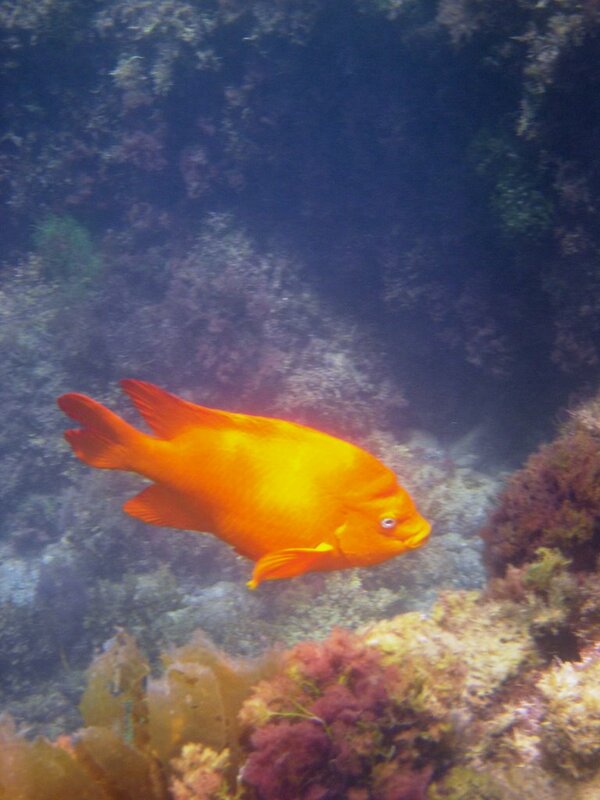 It should eventually become a brilliantly colored staple of stony reefs. 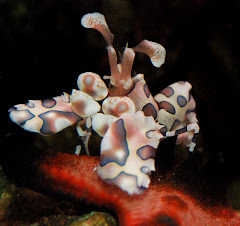 Polyp size leads one to suspect the coral to be either a Poritidae, Faviidae or one of the larger polyp sized Montiporas. 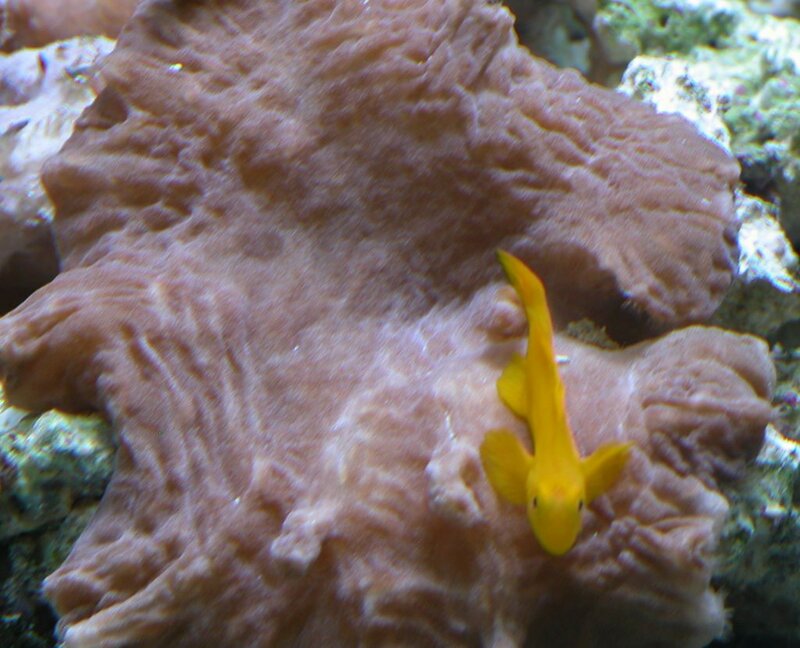 This coral was originally found by Tong's Tropical Fish of Fountain Valley California. Hugo Zuniga (SNIPERSPS) spotted the coral at the reef shop and convinced Steve Tyree of Reeffarmers and Frank Burr of Tropical Reef Oasis into a trip to Tong's Tropical Fish. 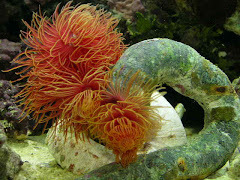 The three negotiated a purchase of a small section of this coral from Tong's. 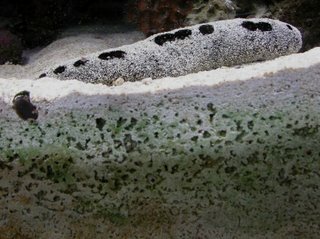 The coral was then cut into three even sections. Reeffarmers acquired one of the sections and is now distributing fragments on a limited edition basis. 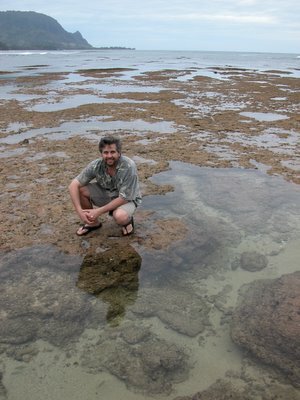 Reef Farmers price is currently $120 per small sized fragment. The monthly limited edition reservation schedule is booked until September 2008. I hope to be able to start fragging this piece by mid 2007 after allowing it to grow to a multiple fragable piece. 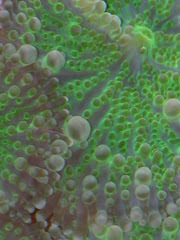 Green Birdsnest The Green Birdsnest coral is a beautiful species, originating from O.R.A and now from Ron Johncola of Reef Tec Designs and grows very thin intertwining branches. 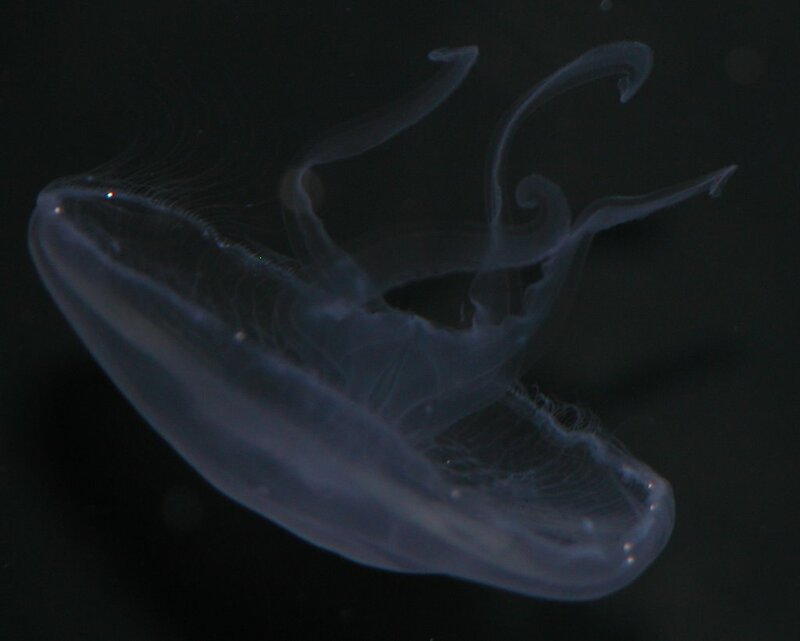 It's green coloration will grow darker in the aquarium with age. 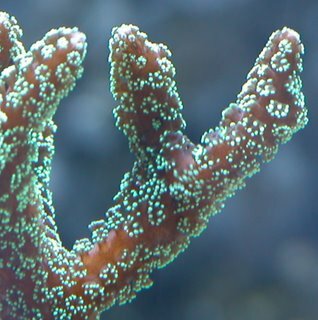 This is a relatively fast growing species, and because of its delicate branches, care should be taken in the placement of the coral in order to protect it from physical damage. The Green Birdsnest coral requires moderate lighting ranging from power compacts, VHO, T-5's up to the more intense metal halides. For continued good health, it will also require the addition of calcium, strontium, and other trace elements to the water. While it does not require additional food to maintain its health in the reef aquarium, it will feed on micro-plankton and foods designed for filter feeding invertebrates. Sponsors/Vendors Golden Sponsors; Mermaid Aquarium, Reef Nutrition Vendors: reeffarmers.com, atlantisaquarium.net, fragfarmer.com, reefready.net, acoralsource.com, awexotics.com, reeftecdesigns.com, jendub.com, yourreef.com, diamondsinthereef.com, newalameda.com, elousa.com. 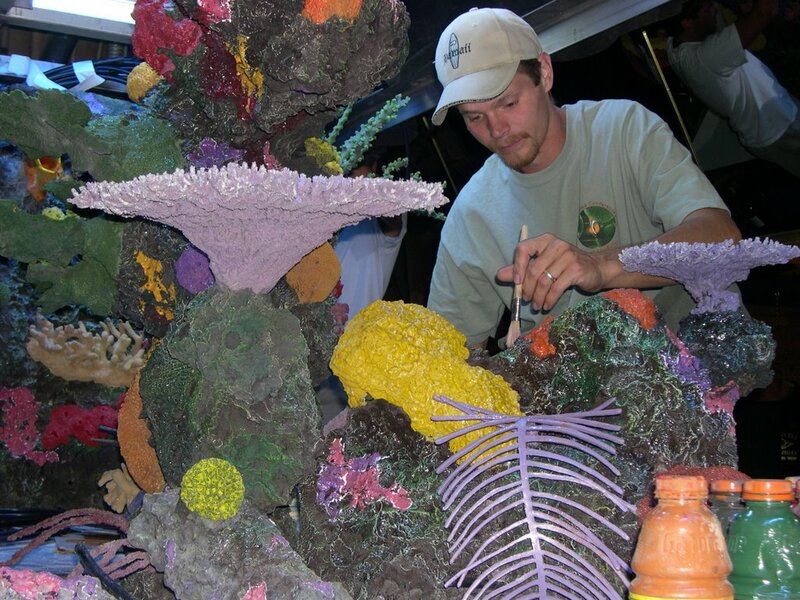 Skyler Allingham of Genesis Systems International cleans a section of the artificial reef at John Ascuaga's Nugget, Sparks Nevada, Trader Dicks 6,000 gallon aquarium in preparation to hand paint coralline algae on the rockwork. 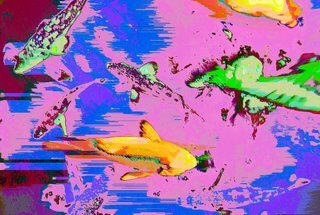 I recommended GSI to Dennis Hegemann, Chief Engineer, to create the structures that wrap Interstate 80's three freeway supports that run straight through the center of the aquarium. 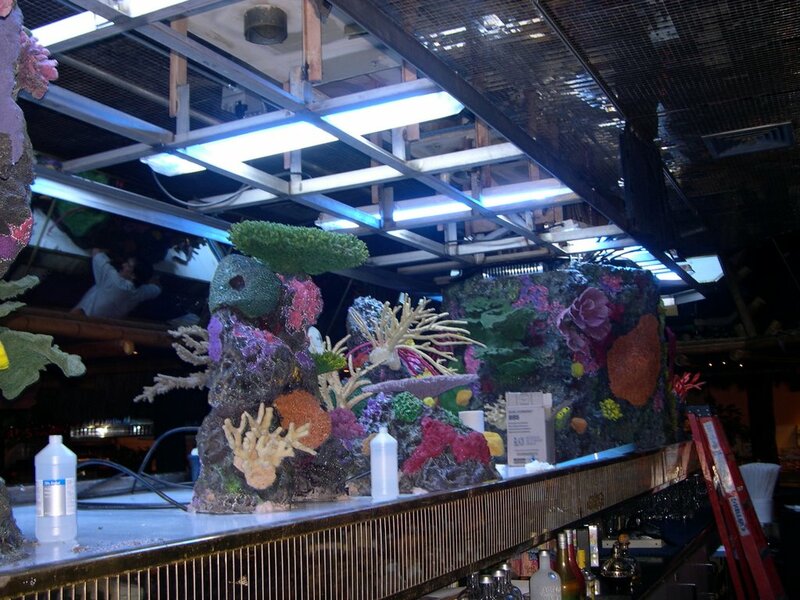 The aquarium is undergoing a complete overhaul with glass replacement, the new artificial reef and filtration. 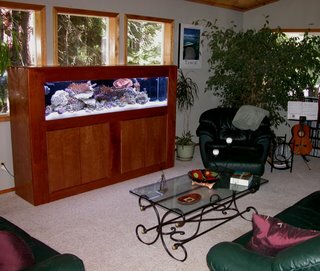 Look for the aquarium to be filled and stocked in late July. 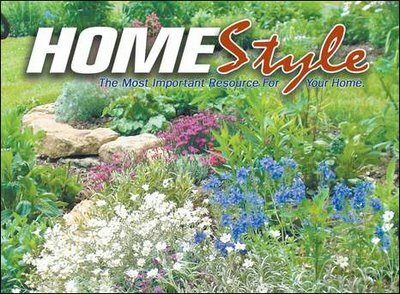 The Spring quarter issue of Home Style magazine, which is circulated as an insert in six Lake Tahoe, Truckee and Carson City newspapers, features an article by Mike Paletta on reefkeeping. Paletta is a speaker at the Western Marine Conference, being held in Sacramento, Calif. on April 21 through 23. If the accompanying photo looks familiar, it was first shown here in October 2005 and was taken in The Home Show Design Center's reef tank and was used on my Christmas card. Getting started in keeping marine fish and invertebrates can be a very daunting task, especially if you are discoursed from doing so by misinformation. 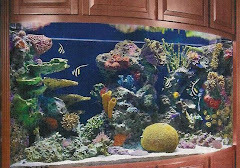 Many shops and individuals initially tell new hobbyists that keeping a successful marine tank, especially one containing corals and other invertebrates as well as fish, is impossible and they should not even try. 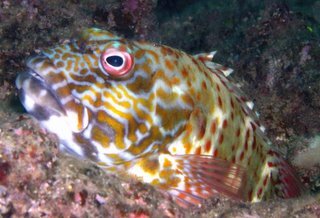 This may have been the case twenty years ago, but fortunately, in the past decade or so, keeping marine invertebrates and fish successfully over the long term has become much easier. In addition, as long as a few things are done before getting started in the hobby, the chances for success are greatly increased as well.The first step is to read as much as possible. 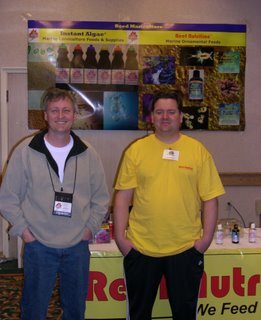 There are now several good introductory books on the market including The New Marine Aquarium and The Conscientious Aquarist that lay out everything a new hobbyist needs to do and plan for in order to achieve success.These books provide an excellent framework from which to start.The rules and general design laid out in these books should be followed by anyone getting started in the hobby. One of the ways by which new hobbyists get into trouble is by listening to too many sources of information and then try to incorporate all of these different opinions into their system. It is much better to follow a relatively simple plan to start and then, as success comes, add to it. In this regard it is also a good idea to try and find a mentor to help you along the way.This can be someone whose tank you have seen, someone you have met on the internet, or even someone whose work you have read. Most advanced hobbyists are willing to help new hobbyists as long as the new hobbyist shows a willingness to learn and put the time into being successful. In terms of time, this is one of the other crucial aspects of reefkeeping that needs to be fully understood if success is to be achieved. First, the initial set up, curing and establishment of the tank is going to take time. So plan on spending a fair amount of time getting your tank established. Fortunately once a tank is set up successfully it really does not take that much time to maintain it.The other aspect of time that needs to be taken into account is that patience is absolutely essential in order to be successful.A number of years ago I made the statement that nothing good ever happens fast in a reef tank, only bad things happen fast. By this I mean that a tank will not be fully established with fullgrown corals, a complete fish population and perfectly working equipment overnight. It will take at least a year for a tank to really be fully established. Even then, a tank will still be in its infancy. 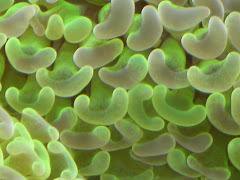 The basic principles behind the establishment of a successful reef tank are actually quite simple: good water quality, proper lighting, strong water motion, and proper stocking.There are myriad ways to achieve these conditions, with no single way being perfect. 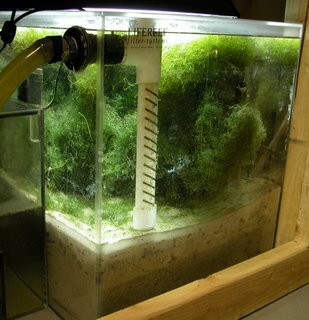 For this reason there are many ways to set up a tank and be successful.The crucial thing is to find a methodology that is successful and follow it.Also, most successful hobbyists are meticulous in terms of knowing the details of their tank and in following up quickly when things start to go even a little wrong. Patience and attention to detail are what separate very successful hobbyists from those that have constant problems so keep this in mind. Cost is also not necessarily the determining factor for success or failure. 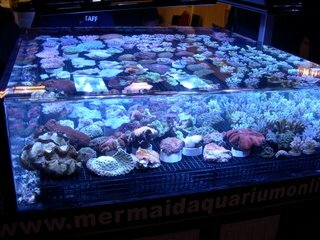 Setting up a reef tank is relatively expensive. 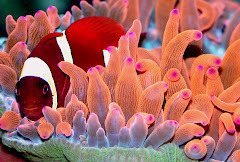 However when done properly, over the long term the cost is manageable as it should not be necessary to have to replace fish, coral or live rock in that in a stable successful system these inhabitants can live happily for decades. Right now reef tanks are the fastest growing segment of fishkeeping so this in itself should be evidence that things are getting easier and people are more successful in this hobby than ever. 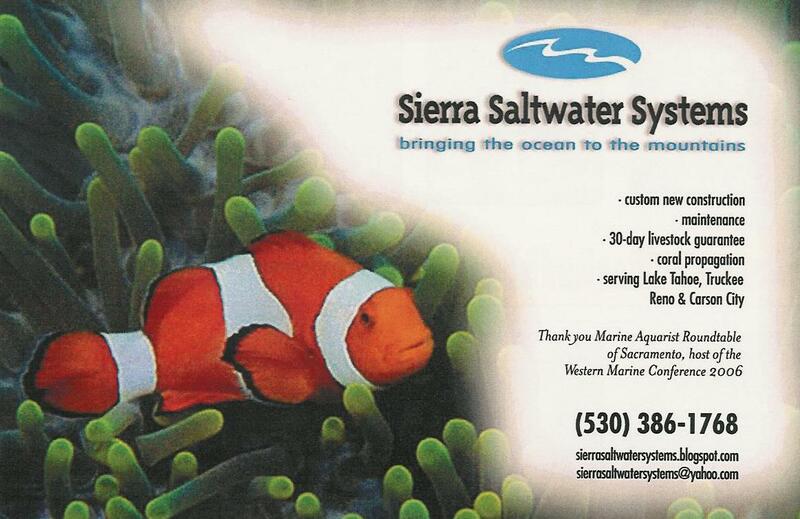 Sierra Saltwater Systems is dedicated to providing the highest quality aquariums and services available. Locally owned and operated by professional aquarist Robert Ordway, Sierra Saltwater Systems works with designers, contractors and you to create beautiful marine environments for residential and commercial applications. 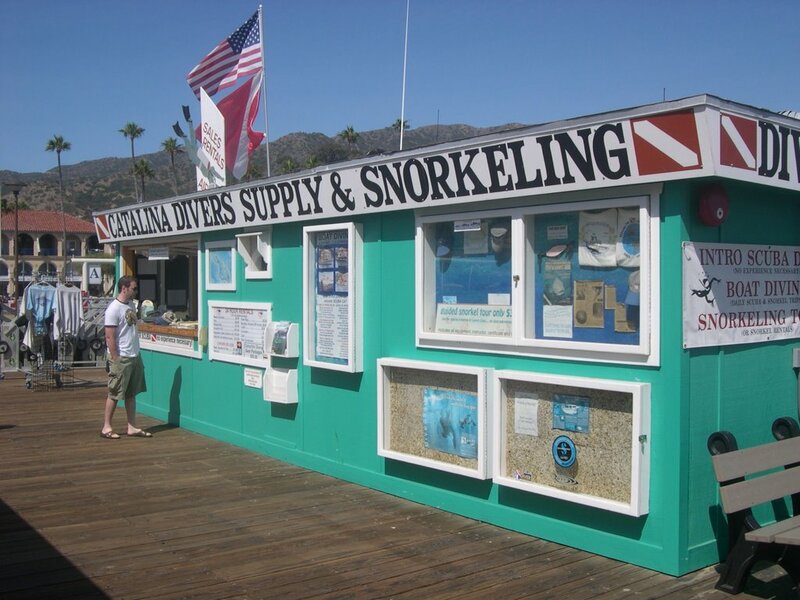 An aquarium store on wheels, they offer healthy, net-caught livestock selected from around the world, hand picked and propagated corals, fresh food and supplements, top of the line dry goods and emergency service. I spent last week on Kauai with my wife and daughter where we had a great time snorkeling, scuba diving, hiking and kayaking. But, it was also the rainiest weather the island had seen in the past couple of years. It actually rained over 20 inches in a twenty-four hour period! 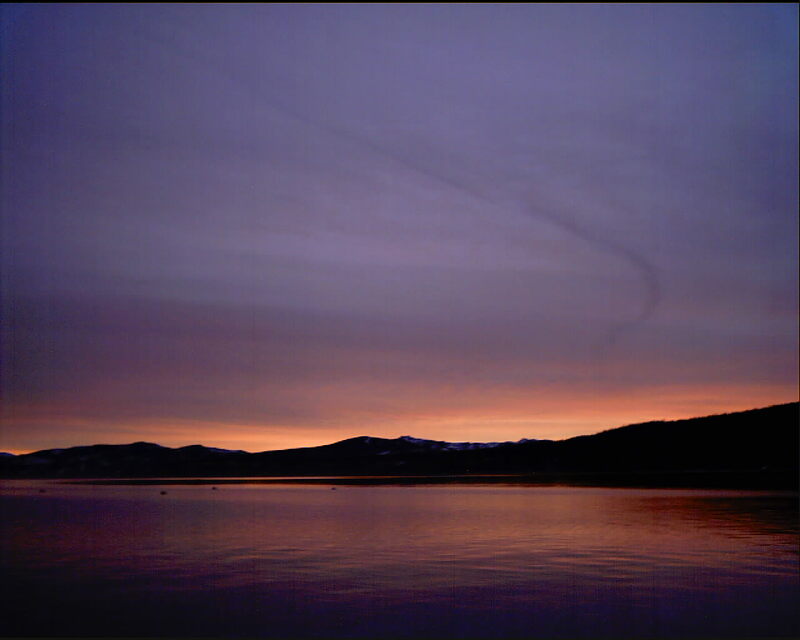 Good thing we weren't there to golf and we had a good laugh when we heard of pipes freezing in Tahoe. Eighty degree weather and rain was not too bad, and when we were underwater it didn't bother us. 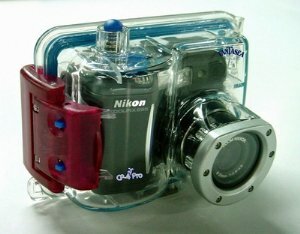 Fantasea CP4 Pro- Before we left home I purchased a Fantasea CP4 Pro underwater camera housing for my "point and shoot" Nikon 4300. 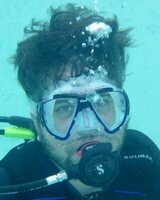 It took a few snorkels to find the best settings for the camera, but overall I was pretty happy with the results. I will be buying an auxiliary flash for the camera to help eliminate the "scattering" that can be seen in some of the photos. The underwater camera also came in hand when we were kayaking. Hideaways Beach, Princeville, Kauai- Just before the entrance to the Princeville Hotel on the north shore is a wonderful secluded beach called Hideaways. 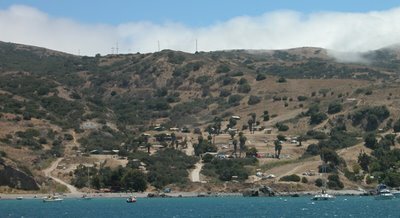 A somewhat steep descent (120 foot) with the top half being steps and a handrail, turned to a muddy and slippery rope hike to the beach. 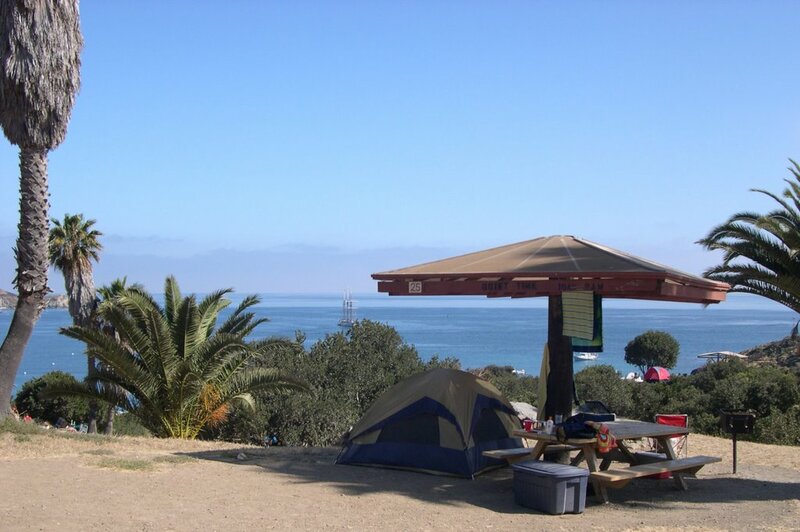 When we arrived we were welcomed by nobody except a breaching grey whale and her pup. 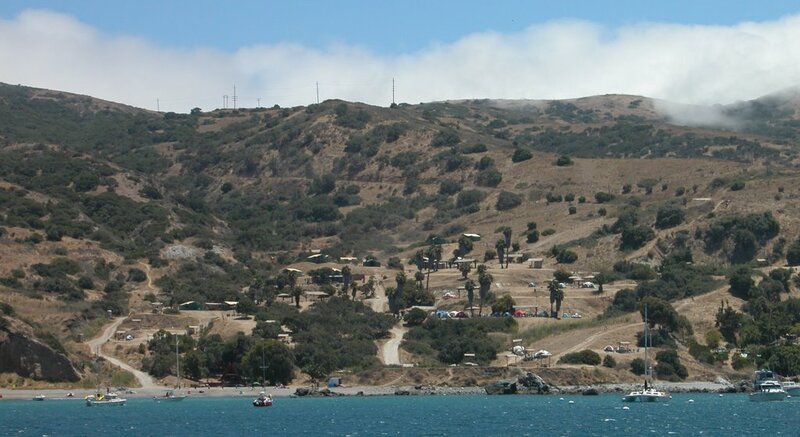 A beautiful snorkel location with a great fish community and an occasional sea turtle. Black Sea Cucumber at Ke'e Beach- Madison shows off one of the many foot long black sea cucumbers that we saw at Ke'e Beach. 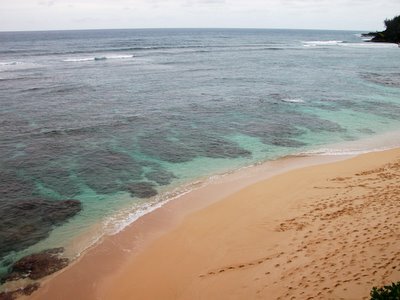 Ke'e is the farthest that you can travel by car on the north side of Kauai. The black sea cucumber is a wonderful aquarium animal that I have used for years to help promote a clean sand bed. Seasport Divers, Poipu- www.seasportdivers.com 1-800-685-5889; Madison and I enjoyed a fantastic day with Kyle McDonald and Captain Hans aboard the Anela Kai. 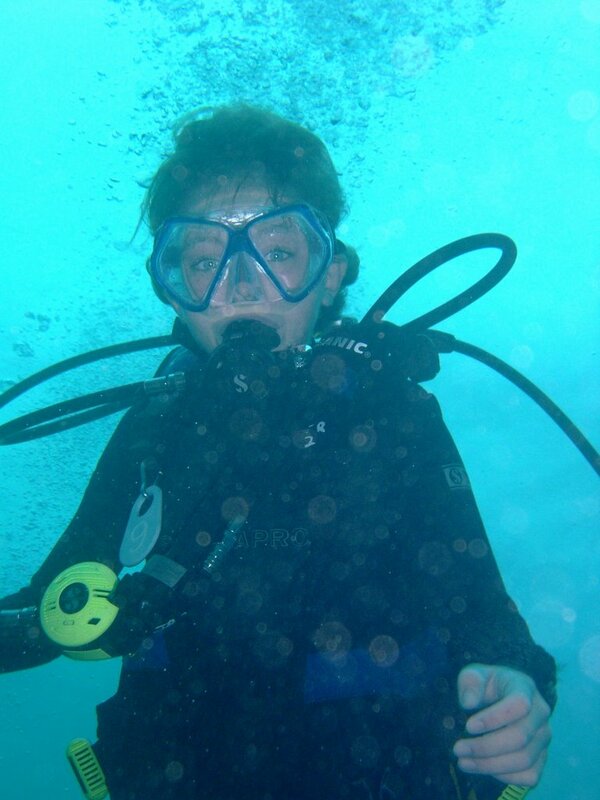 We did the PADI Discover Diving Program. Kyle made our first dives relaxing and safe. Seasport Divers is a multiple Rodale's Readers Choice Awards Winner. 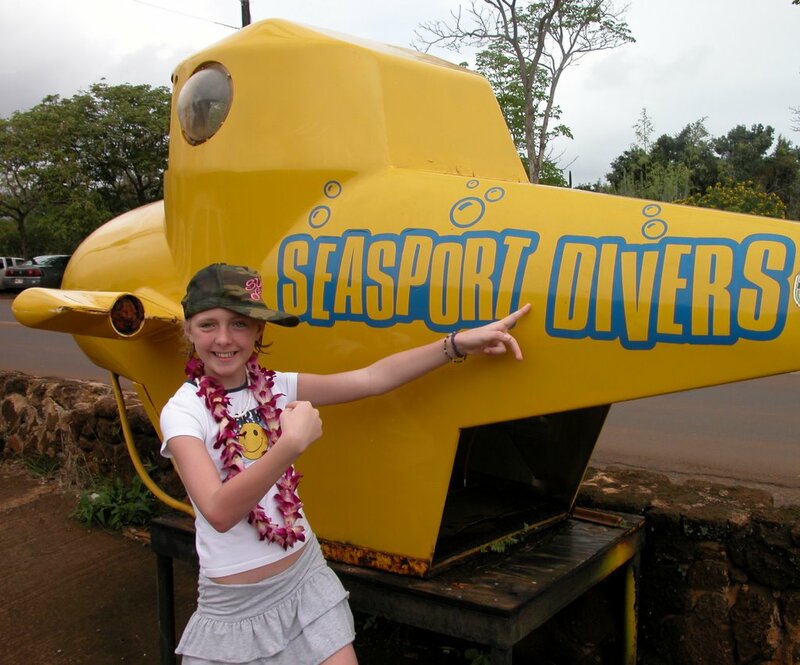 They were voted #1 on Kauai, and #5 in the Pacific and Indian oceans, and also rated as one of the 10 Best Dive Operators in the US, with a straight "A" rating. The experience that we shared with Seasport will definitely lead us on to certification and future dives with their company. Madison shined through her pool dive and emergency training and with a little time adjusting her ears to the pressure of diving she showed no fear or trepidation in the open water. 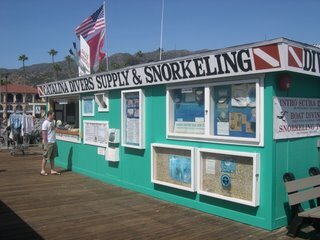 Our first dive was Stonehouse 30 to 65 feet, great site for novice to advanced divers. Named after a house that was destroyed by hurricane Iniki. You can still see some remnants of coral encrusted lawn furniture that was deposited at this dive site. Pennant and milletseed butterflies, frogfish, yellow margin moray eels, pincushion urchins and others can be found at this site. The second dive was Sheraton Caverns: The Signature dive site of Kauai. 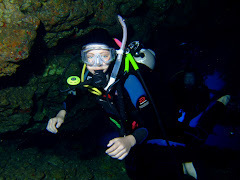 20 to 65 feet, beginner to advanced divers, a must dive! Sheraton Caverns is on the south shore of Kauai just west of Poipu. Ancient blown-out lava tubes now consisting of gorgeous archways and overhangs is also the home to many Hawaiian Green Sea Turtles. 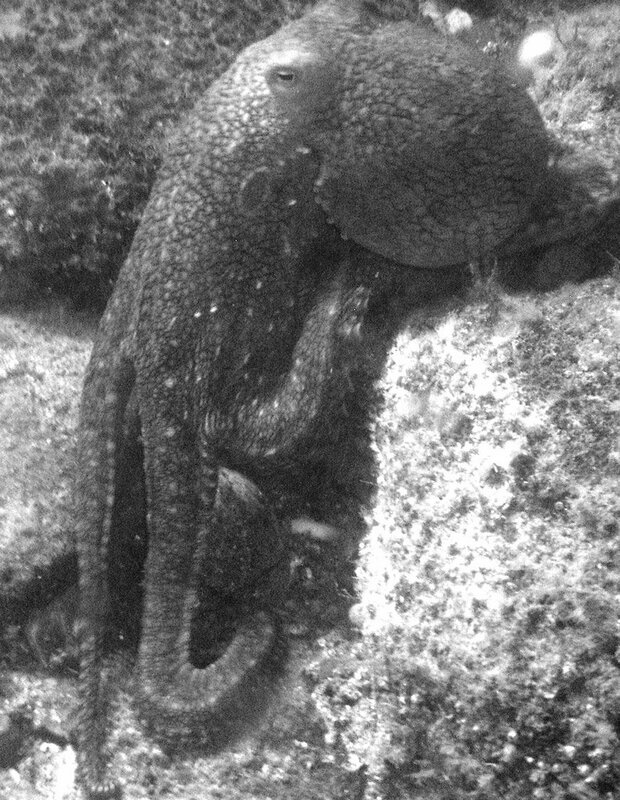 Large whitemouth moray eels, conger eels, octopus, frogfish, spiny and slipper lobsters, shrimp, and a variety of Hawaiian reef fish all reside at this dive site. It's a dive we won't soon forget! The Greasy Grouper- Trying to photograph fast moving fish proved to be a bit difficult at times with my Nikon 4300, but this guy sat and posed for me for a number of photos. 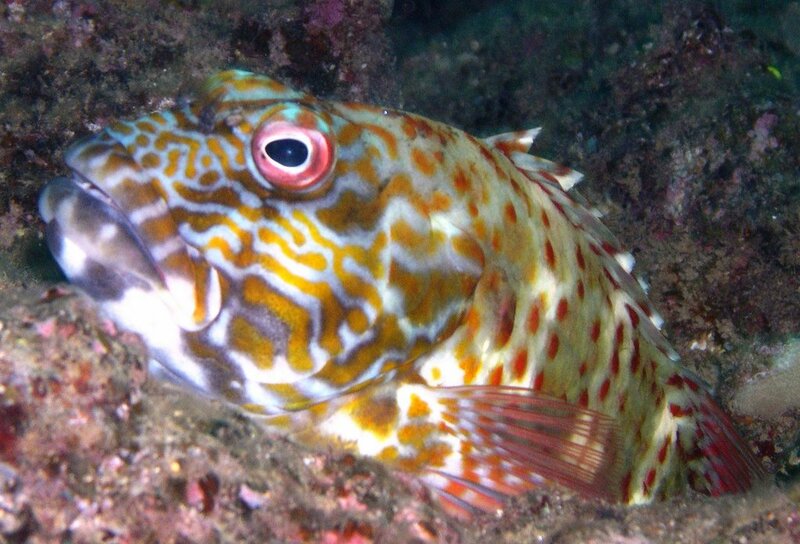 The Greasy Grouper prefers clear water areas on coral reefs, juveniles have been seen from reef flats and in tide pools where the adults are usually found in deeper waters. 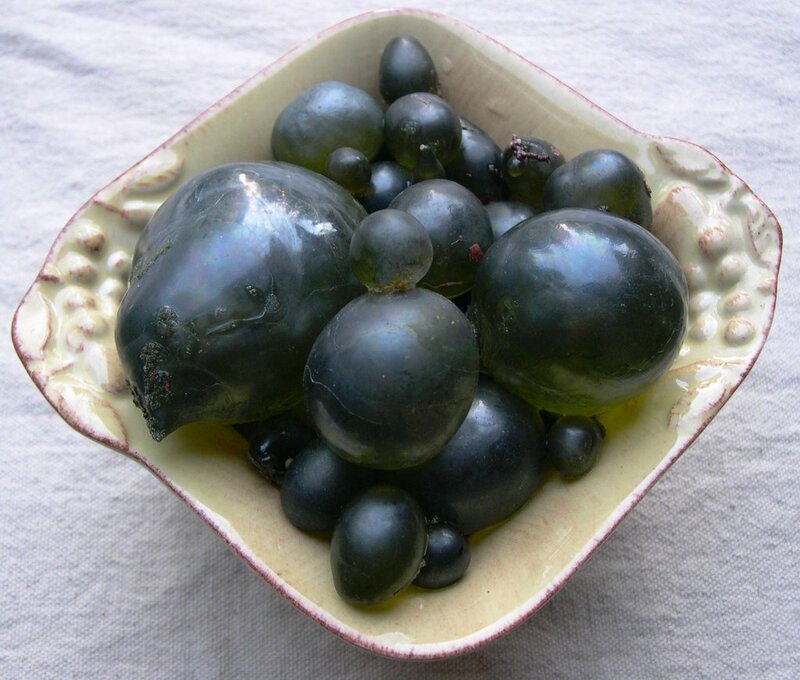 It can be found around the Indo Pacific, Red Sea, eastern African coast south to Durban to Ryukyo Islands, northern Australia to New Caledonia. The Greasy Grouper feeds mainly on fishes, crustaceans and cephalopods. Sea Turtle at Anini Beach Park- While snorkeling at Anini Beach park we came across many Green Sea Turtles. 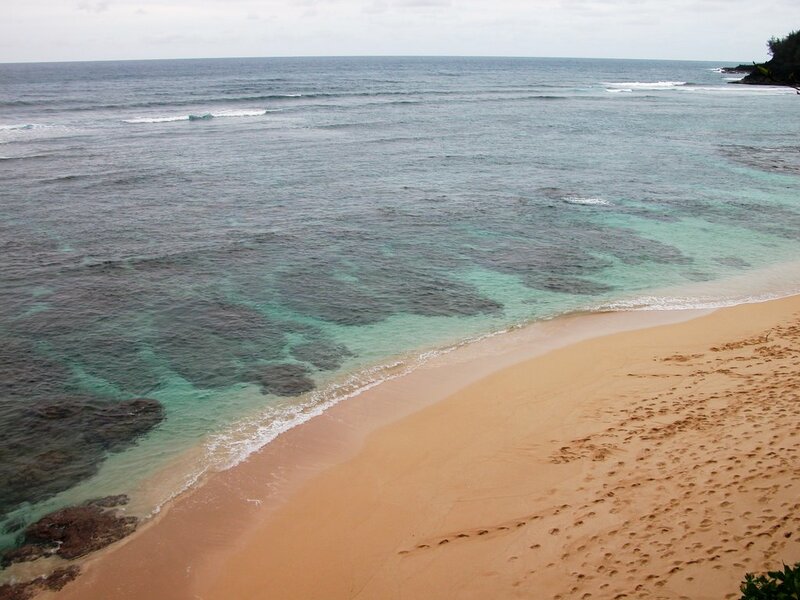 All sea turtles are fully protected under both the federal Endangered Species Act and under Hawaii state law. These laws prohibit hunting, injuring or harassing sea turtles or holding them in captivity without first obtaining a special permit for research or educational purposes. Swimmers and divers should be aware that riding sea turtles is illegal as it puts the animals under unnecessary stress. Fines for violating these laws protecting turtles can be as high as $100,000 and may even include some time in prison. 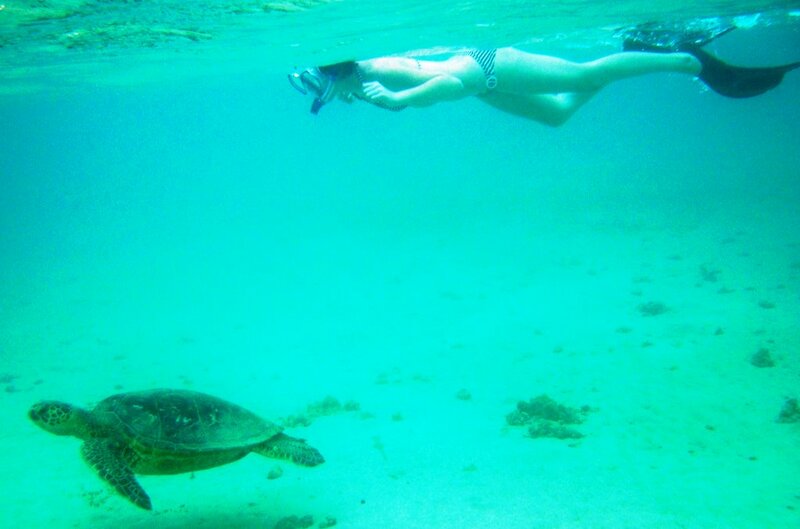 We kept a safe distance from the turtles, but this turtle didn't seem to mind Madison checking it out from above. Princeville Hotel Tide Pools- We stayed a portion of our vacation in Princeville which has some of the best tide pools on the North Shore. 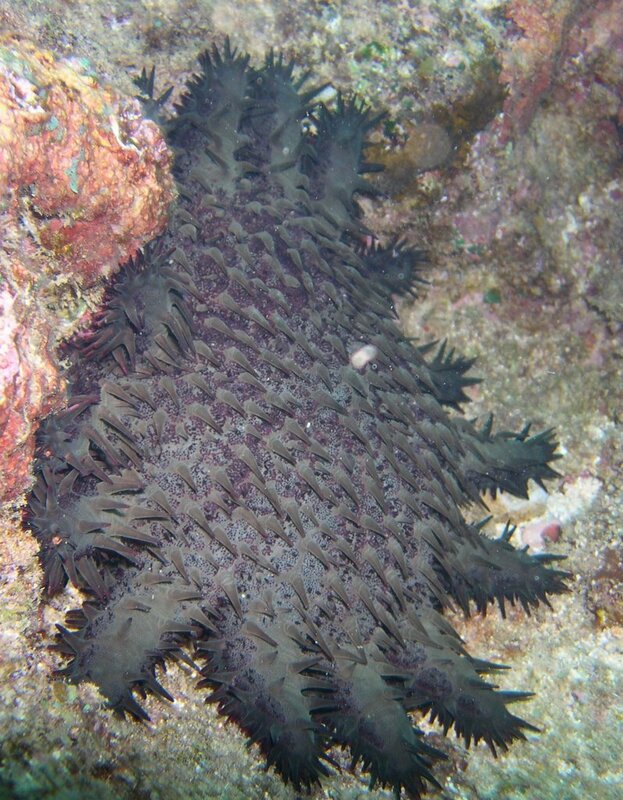 We saw many urchins, gobies, butterfly fish, damsels, crabs and sea cucumbers. In the background of this photo is Bali Hai. Clever photography turned the peak into the mystical island Bali Hai in the movie South Pacific. In ancient times men would climb the 1,600 foot peak carrying spears. When it got dark, they would light the spears and hurl them toward the ocean below. The spears were designed to leave a fire trail behind, and the light show was immensely popular.